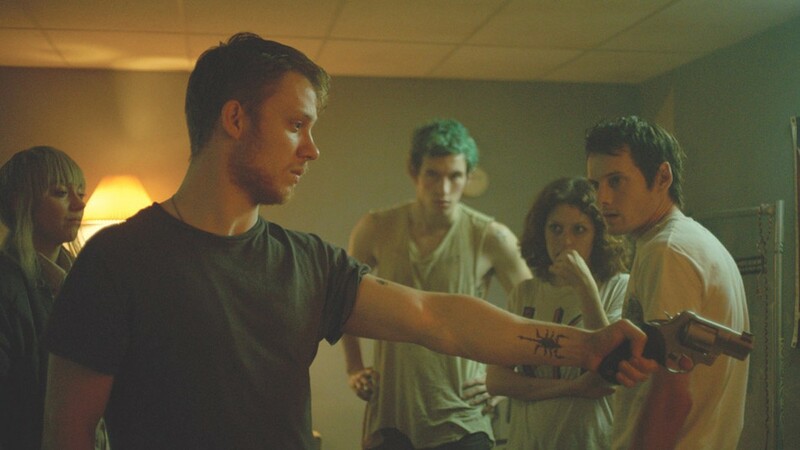 PHOTO COURTESY A24 Imogen Poots, Joe Cole, Callum Turner, Alia Shawkat, and Anton Yelchin in "Green Room." With its killer "punk rockers vs. skinheads" premise, writer-director Jeremy Saulnier's savage indie thriller "Green Room" is a perfect modern midnight movie. As the director himself describes the film, it is a roller coaster. "Green Room" is impeccably crafted, and has enough ideas churning below its murky surface, that calling it merely a genre thrill ride would be selling it short. The entry point into the film's brutal, hard-edged world is the punk rock band The Ain't Rights and its college-age members: bassist Pat (Anton Yelchin), guitarist Sam (Alia Shawkat), drummer Reece (Joe Cole), and vocalist Tiger (Callum Turner). Touring the Pacific Northwest in a beat up van, the band's low on funds and more than ready to get back home to Washington, so they agree to a gig at a backwoods bar that's owned and operated by a gang of neo-Nazis. Money is money, and they're desperate ("Just don't talk politics," advises the friend who sets up the show). Rather shockingly, the actual performance goes off without a hitch (even after the band can't resist stirring the pot by kicking their set off with a cover of the Dead Kennedys' "Nazi Punks F*** Off"). But as they're preparing to leave, one member of the band walks in on the grisly aftermath of a crime they weren't supposed to see. Impulsively and hastily, the group barricades itself in the venue's green room. Eventually the skinheads call in the club's owner, Darcy (Patrick Stewart in a chilling performance), to help contain the situation, and despite their leader's promises to the contrary, it's clear the gang has little intention of letting The Ain't Rights leave -- at least in one piece. The band's only choice is to fight back. They gain the help of the murdered person's friend, Amber (Imogen Poots), another white supremacist turned ally merely by circumstance. Once the siege is underway and more bodies start hitting the floor, the film is relentless, giving off shades of John Carpenter's "Assault on Precinct 13" and Peckinpah's "Straw Dogs." The violence here matters, and every kill hits with brutal force. Bones are exposed, bellies are slit open, and attack dogs rip into tender throats, but somehow none of it feels gratuitous. No matter how gnarly the violence gets, Saulnier knows precisely how much to show us before cutting away. It's brutal. The tactic is appropriate for a film that takes place in a subculture steeped in violence and aggression, but Saulnier draws a distinct line between those striking an artistic pose and the actual violent maniacs (though that lines gets increasingly blurry as the film goes on). "Green Room" may not have the thematic resonance of Saulnier's rural revenge thriller "Blue Ruin," but the director clearly has a different aim with this story. But as Saulnier showed in his previous film, he delights in placing his characters in extreme situations, then sitting back to watch as they improvise and fumble their way through it, with frequently deadly results. He doesn't make the type of thrillers in which the heroes gain superhuman abilities when the need arises. They're not skilled in survival; in fact, they're more often shockingly inept. Saulnier has a masterful sense of tone, and he cultivates a sense that anything can happen; no character is safe, no matter how much we may like them. The film's streak of dark humor does nothing to lessen the nearly unbearable level of tension. There are bloody consequences for our heroes' every slip-up. Production designer Ryan Warren Smith and cinematographer Sean Porter expertly capture the dingy, neon lit world the characters inhabit. The environment is filled out with sparing but sharply drawn characters who feel real -- from each member of The Ain't Rights to Darcy's put-upon right hand man, Gabe (frequent Saulnier star, Macon Blair) who's constantly tasked with cleaning up the gang's frequent messes. In a brilliant bit of casting against type, Stewart makes for a memorable and compelling villain. Darcy isn't a role that requires the actor to chew the scenery, and it's the character's brutal pragmatism that makes him so terrifying. This is a film that isn't afraid to give as much shading to its villains as it does to the heroes, and it's all the better for it. Saulnier is good at tossing in small details to flesh out the film's world, like the way the grunts in Darcy's gang are eager to earn their "red laces." I saw "Green Room" at the Toronto International Film Festival last September with a vocal, appreciative audience. That's clearly the best way to see it. Saulnier knows how to play his audience, and his film requires viewers who are rowdy and willing to scream for more. Check out rochestercitynewspaper.com on Thursday for an interview with "Green Room" writer and director Jeremy Saulnier.